12×12 scrapbook paper is everywhere. But have you ever seen a beautiful digital pattern and wished you could make a 12×12 scrapbook paper from it, but didn’t know how? It’s not as hard as it looks..in fact it’s downright easy! Have you ever drooled over beautiful digital textures used for texturing clothing or 3D models and wondered how to get them into your scrapbook layouts? You can make your own 12×12 scrapbook paper it in just 3 or 4 steps. While the standard size is 12×12 scrapbook paper, you can do this for any size layout if you choose. The thing you want to look for in whatever program you are using is a “pattern” fill or something similar. Here we’ll discuss how to do it in Photoshop. 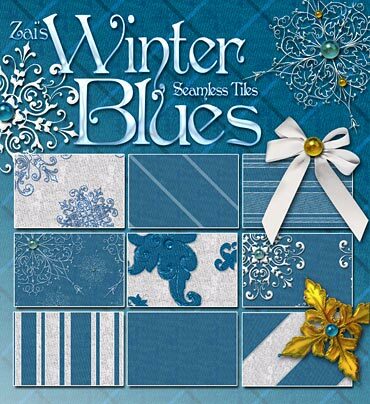 Before we get started, as an example, you can see a set of seamless pattern tiles here in one of my products – Zai’s Winter Blues. It’s a beautiful set of winter fabrics that comes with matching embellishments, but we’re only concerned with the fabric tiles here. They make beautiful papers! I usually include 20-80 tiles in each pack, so that’s a whole lotta 12×12 scrapbook paper designs just waiting to be whipped up! The first thing you need to do is make a 12×12 scrapbook paper base document. Just open a new file in Photoshop and choose the size to be 12” x 12” square. You can do this at 300 DPI if you like with my files as they are designed to be LARGE patterns. If needed you can always shrink them down. Once you have your document ready, it’s time to choose a pattern you want to work with and get it prepped to do your pattern fill. A little bit of experimentation here is sometimes needed until you get the size you like. Remember, these tiles need to be SEAMLESS or it won’t work. The first thing you need to do to create your 12×12 scrapbook paper is define your pattern. All this does is tell Photoshop “use this square image and repeat it until you’ve filled the space”. Choose one of the patterns from your set and open the file. Once you have done that just go up to EDIT > DEFINE PATTERN. You have just saved a pattern to Photoshop’s pattern library! Keep this file open for now in case you want to resize the pattern to something smaller. Next, you need to switch back to your original empty 12×12 scrapbook paper file. Now it’s time to fill that empty space with your pattern. You can do this on the background layer or on a new layer – your choice. Go back up to the top bar and this time choose EDIT > FILL. Here you will choose Use “Pattern” in the Contents section dropdown menu. Under that you will see a little box with the words “Custom Pattern”. Click that and it will pop up a box with all the patterns you have loaded into Photoshop. There will be some defaults that come with Photoshop which you can ignore. The pattern you are looking for will be the very last one. Any time you define a pattern, it saves it as the very last box on the list. It should look like a small scrap of the pattern file you opened in the prior step. Just click it and the box will disappear. Under that you will see a “Blending” section. You usually will not need to worry about this as long as it is set to normal and 100%. You can play with different settings here if you like. Or, if you put your pattern on a layer, you can make the same adjustments later using the layers palette instead. OK..that’s it! You should have a big 12×12 scrapbook paper filled with your pretty pattern! If the pattern is too big, just go back to the original pattern file and resize it by going to IMAGE >IMAGE SIZE and changing the pixel dimensions. Then define your pattern again. 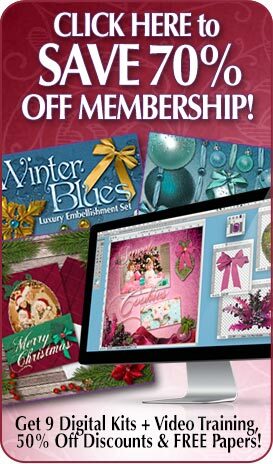 Switch back to your 12×12 scrapbook and do your fill again to see how you like it. Make sure you change the pattern selection to the last one on the list. The little images will look very similar, so just make sure to click the LAST one. If you resize your original pattern, make sure to size it in EVEN numbers both ways so it stays seamless. If it’s 1024 pixels x 1024 pixels, to cut it in half, change the size to 512 x 512 and so on. As long as your numbers stay the same it will be perfectly square and seamless on your 12×12 scrapbook paper file. If you make the numbers different from each other you will stretch your pattern in one direction or the other. It should still remain seamless, but it WILL stretch. If you want it to do that, then OK! When you’re happy with your paper, just save it up! Check out the digital textures section of the store for links to some of my products that are seamless tiles to get you started. Have fun making some great 12×12 scrapbook paper!